Don’t you just love a bowl of cold soup on a hot day? When summer comes around, cold soups start popping up on restaurant menus everywhere. Spanish red gazpacho is the epitome of cold soups, made by pureeing tomatoes and other vegetables with garlic and olive oil. This post however, is about the lesser known gazpacho- white gazpacho or ajo blanco, meaning “white garlic.” White gazpacho is actually the original gazpacho, originating in the Andalusian region of Spain before tomatoes were introduced to the country. Andalusia was occupied by the Moors for hundreds of years in the Middle Ages and their Arabic culture influenced the food of that region.White gazpacho uses inexpensive ingredients like olive oil, garlic, stale bread and almonds, which grow abundantly in that region of Spain. It was often served as a nourishing, refreshing meal for laborers working in the fields under the hot sun. Almonds and olive oil provide heart healthy unsaturated fats. Almonds additionally provide protein and fiber as well as several other nutrients that have beneficial effects on heart health. To read more about the health benefits of nuts, click here. Cucumbers and grapes are packed with water to keep you hydrated and provide several important nutrients including Vitamin C, Vitamin K and potassium. 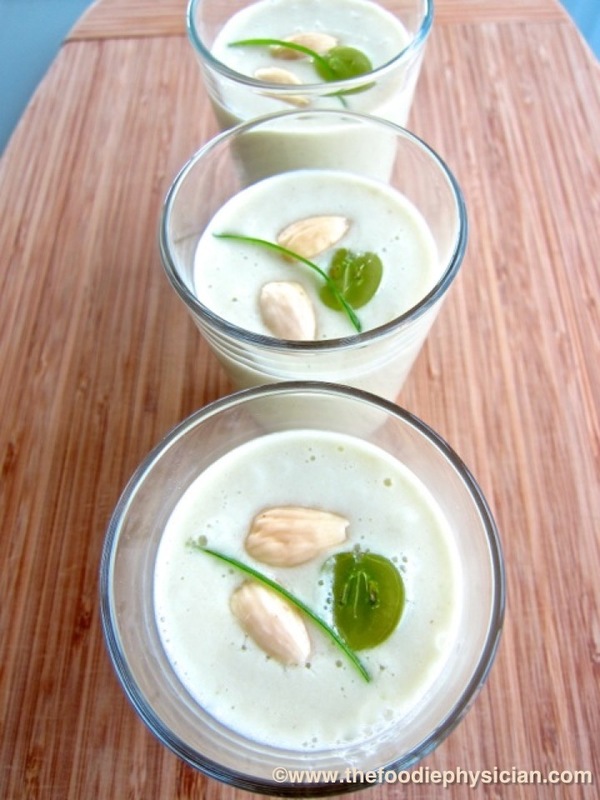 Traditionally made with a mortar and pestle, the base of white gazpacho consists of blanched almonds and garlic that are mashed into a paste. You want to make sure to use blanched almonds which have the skins removed since the skin adds a slightly bitter flavor and alters the color of the soup. Stale bread (soaked in water to soften it) and olive oil are then added to form an emulsion. Although traditional white gazpacho uses a large amount of olive oil, I cut down on the amount and found that it didn’t sacrifice the taste or texture of the soup. Cucumbers, grapes and a shallot are then added to provide fresh, vibrant flavor as well as a touch of sweetness to mellow out the garlic. A splash of Spanish sherry vinegar adds just the right amount of acid to round out the dish. I make my gazpacho in a blender- first I grind up the almonds and garlic and then I just throw in the rest of the ingredients and blend until smooth. It doesn’t get much easier than that! It can be served at room temperature but I prefer to refrigerate it for a couple of hours before serving. That also gives the flavors plenty of time to meld. You can thin it out with water to achieve the consistency that you like. I like to serve my gazpacho as is but if you want it completely smooth, you can pass it through a strainer or chinois before serving. 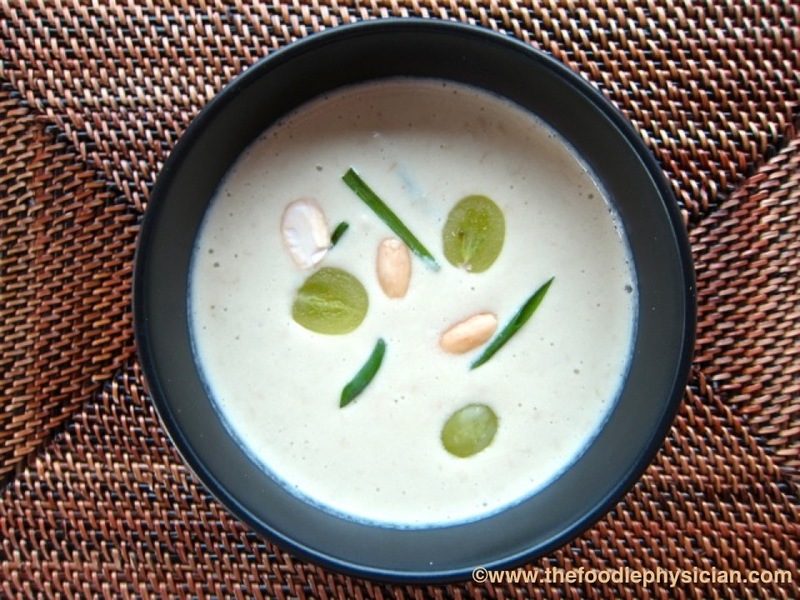 I garnish my white gazpacho with slices of almonds, grapes and a bit of chive or scallion for a burst of color. This dish makes a perfect appetizer for a summer barbecue or Spanish tapas party. Get creative and try different varieties of gazpacho like watermelon or peach. For a gourmet flair, try serving your gazpacho as shooters in small glasses. Place the bread cubes in a bowl and pour ½ cup water on top to soften them. 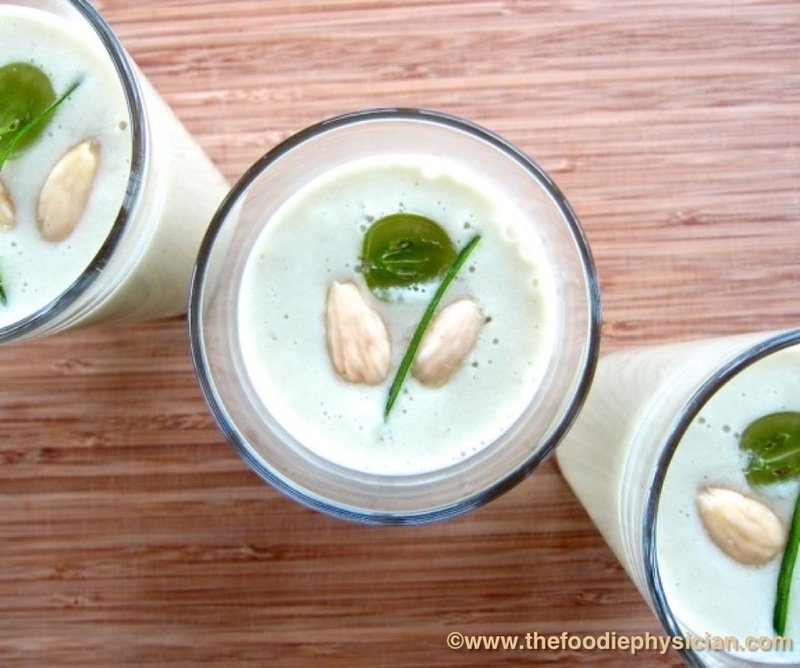 Place the almonds and garlic in a blender and puree until finely ground. Add the shallot, cucumber, grapes, oil, vinegar, salt and softened bread to the blender along with the remaining 1 cup water. Puree until smooth. Taste and adjust salt as needed. Add more water to the soup as needed to achieve desired consistency. Serve at room temperature or chilled. Serve in bowls or glasses and garnish with sliced grapes, almonds and chives or scallions if desired. I learned something new! Had no idea red gazpacho was not the original. The recipe looks delicious and the photos are beautiful! Thanks, Ann- I had fun learning about it too! Oh, I'm trying this! New fan from http://rantsfrommycrazykitchen.com! Thanks for visiting, Bernadette- Let me know how it goes if you try it! Thanks for the luv, Ally! I usually make red gazpacho too but now I've been converted! I love summer gazpachos. I never thought there is anything more than the red one. This is interesting, I love varied options. This is a must try! Indeed so elegant! Thanks for stopping by! Congrats on the new site- I'm heading over now! I have to admit, with the exception of a fantastic strawberry soup I once tasted, I'm not crazy about cold soups. I find that they can sometimes turn out bland or under-seasoned. But your gazpacho looks stunning! 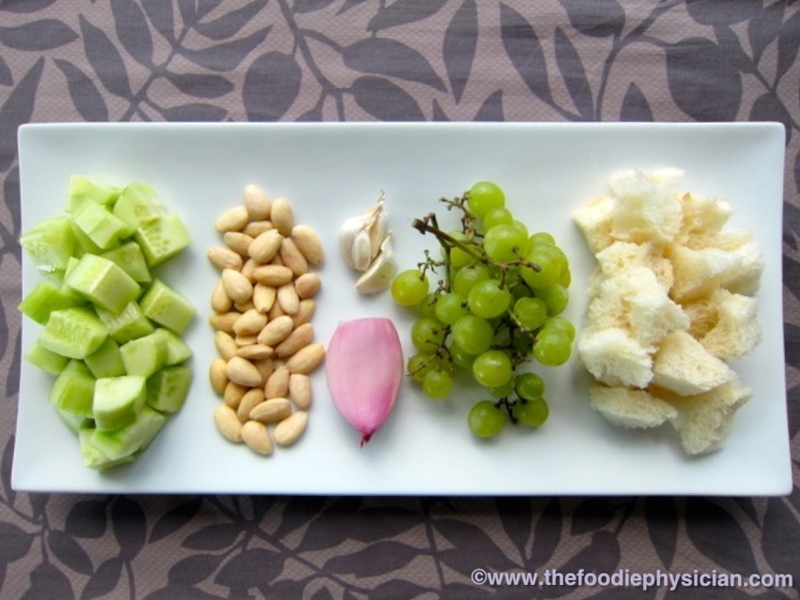 I'm loving the idea of adding blanched almonds and grapes to it! Thanks Amrita! This one has a lot of flavor and the longer you let it sit, the more flavorful it gets. I hope you try it! It's nutritious and really refreshing, especially in this heat. Thanks! Thanks- let me know how it goes if you try it! This recipe has caught my eye several times now! On Facebook, on Amee's Fit & Fabulous Fridays – it is just wonderful and your photos are gorgeous! Thanks so much! Aren't there so many great recipes on Amy's Fit & Fabulous Fridays? Very interesting recipe. I love the color and texture looks so refreshing. Thank you! It's definitely an interesting combination of ingredients but they all come together so well. Mmmmmm….I want a bowl of this gorgeous soup right now!!! I love the name , white gazpacho for such a simple ,easy to make soup.It is perfect for a hot summer day. Refreshing!!! While teaching conversational English to fellow physicians in Spain we were served a white gazpacho. What a wonderful delight! My attempts to recreate it here have been mediocre at best. This might be on the menu at our Easter bbq next weekend as it's 80 here in California. Thank you! Nice refreshing dish and looks stylish as well.